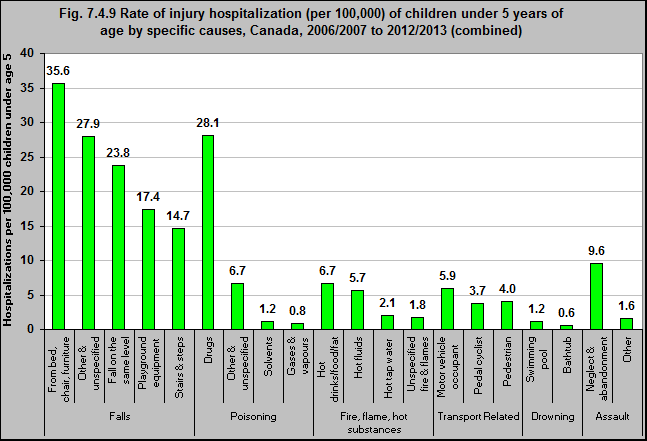 In the combined years 2006/07-2012/13 in Canada, about 30% of hospitalizations due to falls among children under 5 were falls from beds, chairs or other furniture. During that period, the rate of injury hospitalization due to this cause was 35.6 per 100,000 children under 5. 43% of all of the hospitalizations due to fire, flames and hot substances were due to burns from hot foods, food or fat. The rate of hospitalization due to these causes was 6.7 per 100,000 children under 5. 37% were due to hot fluids (5.7 hospitalizations per 100,000 children under 5). Almost 40% of all transport related hospitalizations occurred as a result of the child being a passenger in a motor vehicle (5.9 hospitalizations per 100,000 children under 5). 27% were pedestrians (4.0 per 100,000) and 25% were cyclists (3.7 per 100,000). 41%of all hospitalizations due to drowning resulted from the child being in a swimming pool (1.2 per 100,000). 21% were drowning in bathtubs (0.6 per 100,000). 58% of all hospitalizations due to homicide & assault were due to neglect and abandonment (9.6 per 100,000).